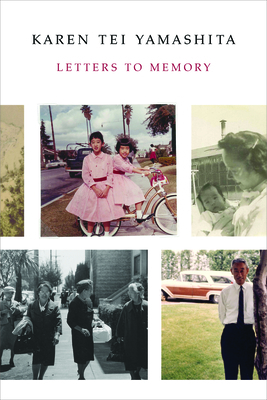 Letters to Memory is an excursion through the Japanese internment using archival materials from the Yamashita family as well as a series of epistolary conversations with composite characters representing a range of academic specialties. Historians, anthropologists, classicists--their disciplines, and Yamashita's engagement with them, are a way for her explore various aspects of the internment and to expand its meaning beyond her family, and our borders, to ideas of debt, forgiveness, civil rights, Orientalism, and community. Karen Tei Yamashita is the author of Through the Arc of the Rain Forest, Brazil-Maru, Tropic of Orange, Circle K Cycles, I Hotel, and Anime Wong, all published by Coffee House Press. I Hotel was selected as a finalist for the National Book Award and awarded the California Book Award, the American Book Award, the Asian/Pacific American Librarians Association Award, and the Association for Asian American Studies Book Award. Karen Tei Yamashita: Karen Tei Yamashita is the author of Through the Arc of the Rain Forest, Brazil-Maru, Tropic of Orange, Circle K Cycles, I Hotel, and Anime Wong, all published by Coffee House Press. I Hotel was selected as a finalist for the National Book Award and awarded the California Book Award, the American Book Award, the Asian/Pacific American Librarians Association Award, and the Association for Asian American Studies Book Award. She has been a US Artists Ford Foundation Fellow and co-holder of the University of California Presidential Chair for Feminist & Critical Race & Ethnic Studies. She is currently Professor of Literature and Creative Writing at the University of California, Santa Cruz.